• Status LEDs for Power, RX, TX, IR signal and D13. to the A3906 motor driver may occur. external devices controlled via the onboard power switch. prevents damage if the battery is accidentally connected the wrong way. is possible by driving both inputs high. inputs so your program will know if your robot gets stuck. The MMA7361L detects acceleration due to both gravity and motion on all three axis’s. switches. 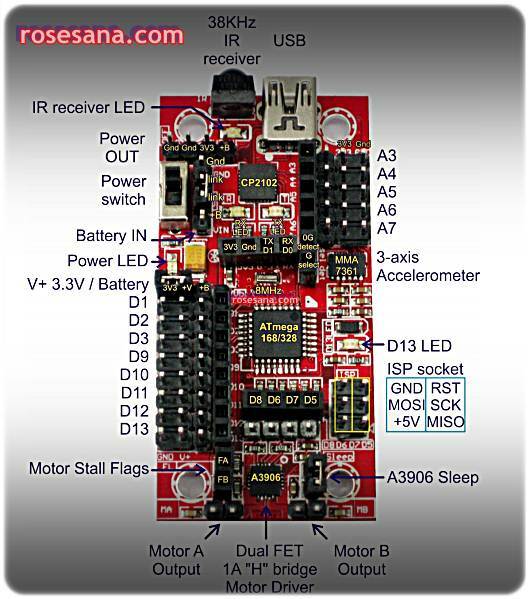 This sensor uses Analog inputs A0, A1 and A2.